Sir Joseph Whitworth, the nineteenth century machine toolmaker and engineer, owned Stancliffe Hall in Darley Dale. He died at Monte Carlo on 22 Jan 1887, aged 83, and was buried at St. Helen's on 2 Feb 1887. During his lifetime he drew up plans for the village and these were fulfilled thanks to generous endowments from his estate. He had, according to his biographer Terence Kilburn, hoped to build a Comprehensive Village College but his wife, Mary Louisa (formerly Orrell) preferred a Social Centre. 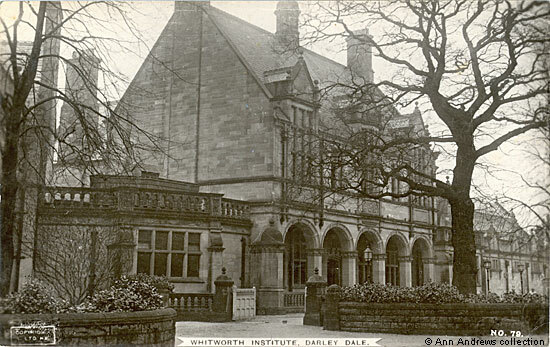 The Institute was a compromise and is just one of the things the Whitworths did to enrich the lives of Darley Dale's inhabitants. The Institute was completed shortly after Whitworth Hospital and not long before it was finished a report of the project was published in The Derby Mercury. "The Whitworth Institute is near Darley Railway station. The cost must approach 20,000l.. In it there will be baths, reading room, and concert room ; and 14 acres of land to be laid out for recreation purposes, such as football, cricket, lawn tennis and other amusements". In August 1908 the Manchester Guardian published details of Whitworth's estate, out of which his Executors had contributed £69,724 17s. towards the Institute, the Hospital and other projects in Darley Dale. Although she wasn't present at the Institute's opening ceremony Lady Whitworth wrote a letter that was read out to those who attended. Afterwards the building was described as follows: "The east front is built of Stancliffe stone, which is noted for its great durability. The east front - that facing the Matlock Road - is composed of a five pillared arcade, by which entrance is gained through a Gothic door. Immediately over the arcade are three large perpendicular windows, the centre being an oriel ... The semi-circular room which forms the southern adjunct to the building is the billiard-room." ... "The swimming bath is at the other end and at the back a covered gymnasium". After Lady Whitworth died Stancliffe Hall became a boys' preparatory school and the two large portraits of Sir Joseph and Lady Whitworth that had been at the Hall were moved to the Institute. Kilburn, Terence (1987) "Joseph Whitworth, Toolmaker", Scarthin Books, Cromford, ISBN 0 907758 22 3. Kilburn's book was the first modern popular biography of him. The foreword was written by A. E. Derbyshire, the then Chairman of the Whitworth Trust. Joseph Whitworth - "Lives Which Hung by a Thread", a magazine article about the Whitworth Sharpshooter which now includes (Dec 2008) additional material about both Whitworth and the development of the rifle.